Intuition has tremendous allure because it's thought to hold the key to unexpected discoveries, big picture insights, and paradigm shifts that can create or break whole disciplines. Because intuition is a less conscious process than logic or deductive thinking, it is also mysterious and unpredictable. We've written about the right hemisphere's role in insight before, but Australian researchers have now find that giving an electrical jolt to the right anterior temporal lobe while suppressing the left improved problem solving by insight. "60 healthy right-handed participants were asked to take an insight problem solving task while receiving transcranial direct current stimulation (tDCS) to the anterior temporal lobes (ATL). 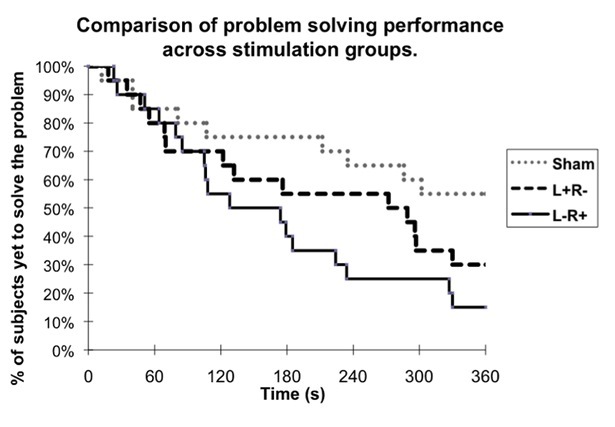 Only 20% of participants solved an insight problem with sham stimulation (control), whereas 3 times as many participants did so (p = 0.011) with cathodal stimulation (decreased excitability) of the left ATL together with anodal stimulation (increased excitability) of the right ATL. We found hemispheric differences in that a stimulation montage involving the opposite polarities did not facilitate performance. Our findings are consistent with the theory that inhibition to the left ATL can lead to a cognitive style that is less influenced by mental templates and that the right ATL may be associated with insight or novel meaning." the specific brain areas involved with verbal processing. If it decides to turn on parts of the right hemisphere, then we might end up with an insight; if it decides to restrict its search to the left hemisphere, we’ll probably arrive at a solution incrementally or not at all." Don't sign up for electrical stimulation right away though. There are other ways. Though insight-based thinking may not be a fully conscious process, we do know many situations that favor or disfavor insight. 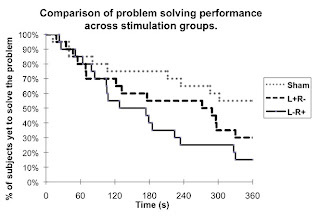 Sensory overload (including visual details) and verbal explanation can impair insight, as can stress and involvement in competing cognitively demanding tasks. To favor insight, one needs to do the reverse - remove one's self from visual or other sensory overload, avoid talking and active thinking - in other words, RELAX. Avid readers of the biographies of famous discovers know that many of the most famous breakthrough insights in history have occurred after men and women had labored hard and unsuccessfully on a problem, then took a nap, travelled, took a shower, or went on a walk. "I turned my attention to the study of some arithmetical questions apparently without much success and without a suspicion of any connection with my preceding researches. Disgusted with my failure, I went to spend a few days at the seaside, and thought of something else. One morning, walking on the bluff, the idea came to me, with just the same characteristics of brevity, suddenness, and immediate certainty, that the arithmetic transformations of indeterminate ternary quadratic forms were identical with those of non-Euclidean geometry...Most striking at first is this appearance of sudden illumination, a manifest sign of long, unconscious prior work. The role of this unconscious work in mathematical invention appears to me incontestable..."